Compared with removing blemishes with fingers, this tool clears blemishes safely without the risk of contamination or further damage. It is favored by professional dermatologist and beautician&apos;s. It&apos;s also widely used in spas and salons for blemish, pus removal, acne, pimples and facial impurities treatment. Come and have a try. Needles are made of medical grade stainless steel, allow safe sterilizations, helps minimize risk of infection. 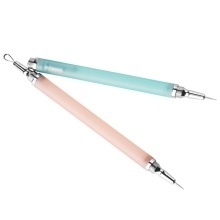 Double-head, it has a needle on one end and an open circle loop on other end to remove blemishes. Invisible design and compact size, more convenient for you to carry away or store. Easy to assemble and disassemble, suitable for professional use or personal use. Helpful for removing whitehead, pimples, milia and general comedones. Note: Color of the item will be delivered at random.